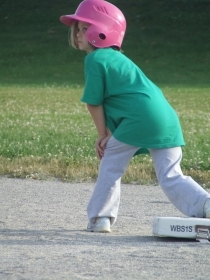 The Forest Hill T – Ball Association has adopted these rules to maintain an appropriate balance between flexibility and consistency. The official rules of baseball published by the Ontario Baseball Association (OBA) apply whenever the association or league rules do not override them. The association secretary is responsible for maintaining a copy of these rules. These rules are designed to avoid confusion and to guide coaches, players and parents to ensure fairness and equality during games. It is still the responsibility of all parties involved to demonstrate good sportsmanship conduct in line with the association’s objectives of developing player’s skills in a fun and learning environment. Arrive at the park before game time (as directed by your coach). This will ensure there is adequate time for warm-up and that games will begin on time. The use of tobacco or alcohol on the field or benches is PROHIBITED. The game begins at the designated start time when the coaches declares play ball (a 5 minute grace period is allowed if there are insufficient players to start). Both coaches should discuss if a game should be canceled due to in climate weather. The safety of the players must take priority and no game can continue if lightning is observed. The home team prepares the field for the game (tee, bases, lines, etc.). All players must wear a league cap and shirt. No jewelry can be worn with the exception of Medical Alert necklaces and/or bracelets. No metal cleats are allowed. It is mandatory that long pants be worn. NO SHORTS. All players that are either on deck, batting or running the bases must wear a helmet with the chinstrap fastened before play can start. Ball gloves are not necessary but they can be worn if they choose to. No scores will be kept for Blastball because all games end in a tie. In an open area, field, park or diamond, position your tee/home plate so that hitting allows you a safe area of play. Like regular ball diamond, from the tee pace off 15 feet to the right and position your Blastbase. This establishes your fair/foul line to the right. To the left of the tee and perpendicular to your Blastbase line, pace off an equal distance and position your cone. This establishes your fair/foul line to the left. Now pace off 7.5 feet directly in front of the tee and lay out your line marker between the (hypothetical) 1st & 3rd base lines, this becomes the dead ball line. If the ball is hit inside of that line it is foul and should be re-teed for another try. If it goes beyond the line, either in the air or on a roll it is considered in play. The defensive players take the field behind the dead ball line. The 1st batter hits the ball off the tee and runs to the blastbase, if the batter reaches the base and “Honks” before a defensive player catches the ball in the air (an automatic out) or fields it and raises his arm with the ball in it and yells “Blast”, he/she scores a run. If the ball is caught or fielded and “Blast” is yelled before the runner gets to the blastbase, then the runner is out. Each team will bat all players once per inning then change sides.